In this recipe we explore a little known cheese from the Dolomites of northern Italy. Schiz (shkee) is about as fresh and simple a cheese as you can imagine making. With origins from the high mountain pastures of the Dolomites, a beautiful place for a beautiful cheese. This is a cheese that can be heated without melting, for a beautiful caramelized treat that is traditionally served with Pasta or Polenta. 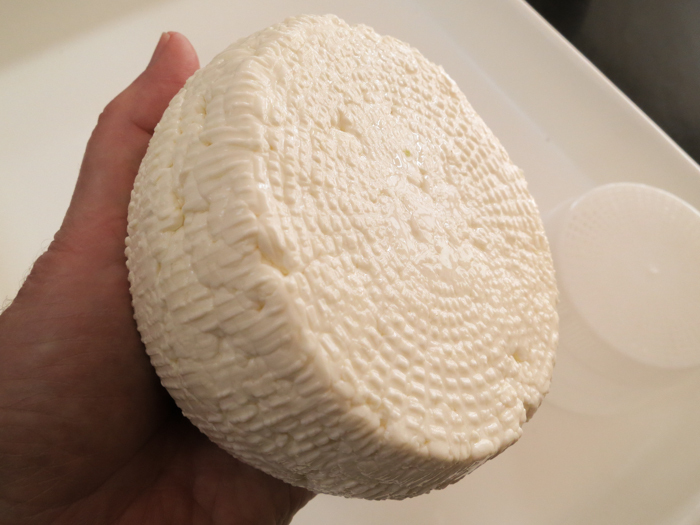 This is a great basket cheese mold for draining soft cheese or lightly pressing hard cheese. 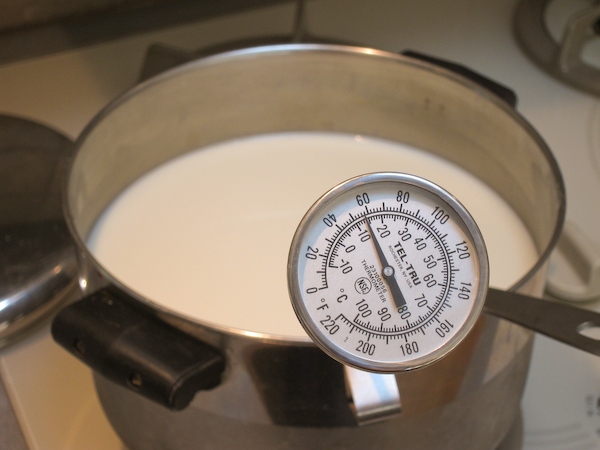 Begin by heating the milk to 96F (35C). You do this by placing the pot of milk in another larger pot or sink of very warm water. If you do this in a pot on the stove make sure you heat the milk slowly and stir it well as it heats. No culture will be added. 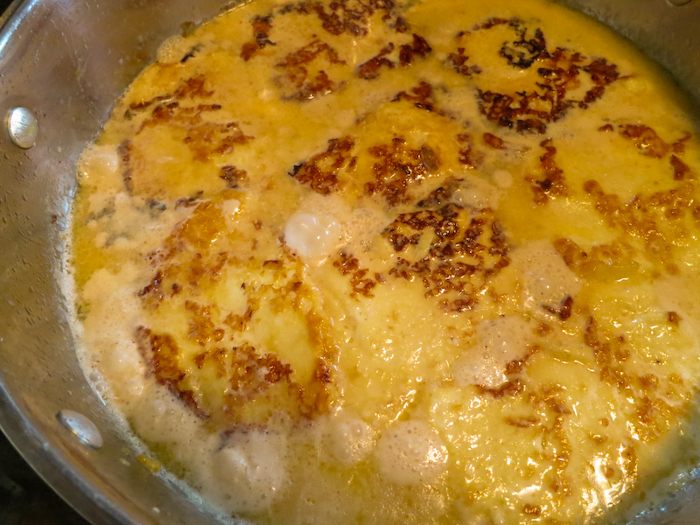 This will allow all of the lactose in the milk to remain in the cheese, which gives the cheese a very sweet flavor and that wonderful caramelization when the cheese is fried. It will also mean that the cheese needs to be eaten fresh to keep any non-dairy bacteria from producing bad flavors and smells. If using pasteurized cold stored milk or having problems with forming a firm curd add 1/4 tsp calcium chloride to the milk while heating. 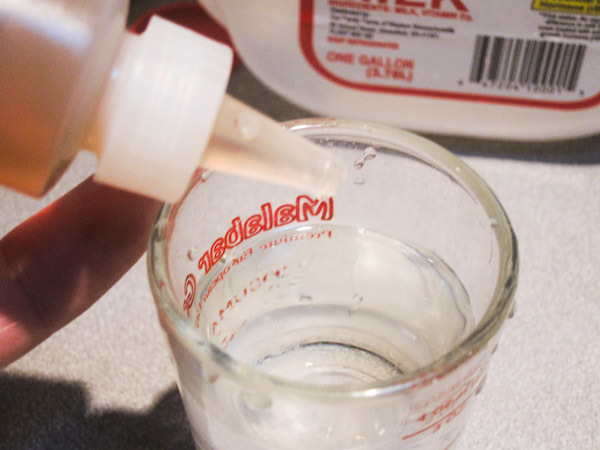 Then add 1/4 tsp (1.25ml) single strength rennet or ~ 1/4 tablet. Stir for one minute with an up and down motion with the spoon or ladle, then stop the milk moving with a slight back stir. The milk now needs to set (still) for 30 minutes while the rennet works and coagulates the milk into a firm curd. You will notice the milk beginning to thicken at about 5-10 minutes, as in the photo to the right. The thermal mass of this milk should keep it warm during this period. It is OK if the temperature drops a few degrees during this time. 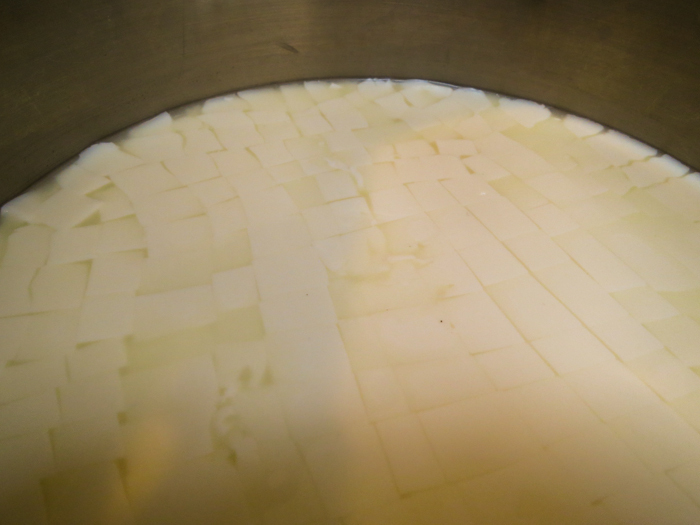 Next, cut the coagulated curd in a vertical direction with your knife both ways across. Allow this to set for 2-3 minutes while the whey begins to show in the cuts. 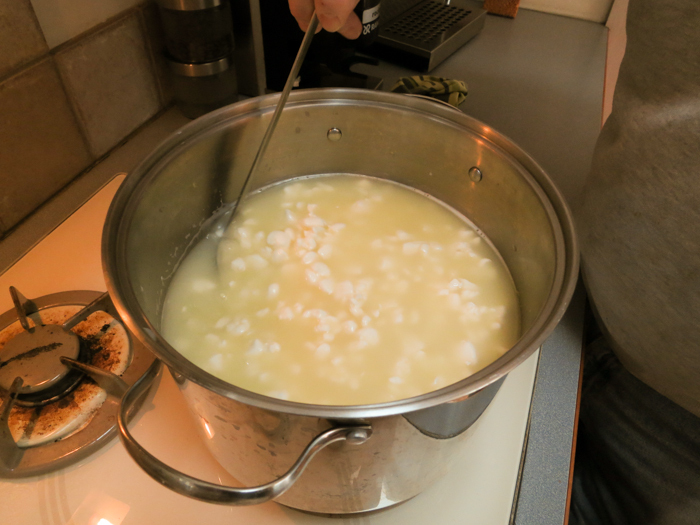 Then, cut horizontally with a ladle or spoon, resulting in the final curds being the size of beans or corn. 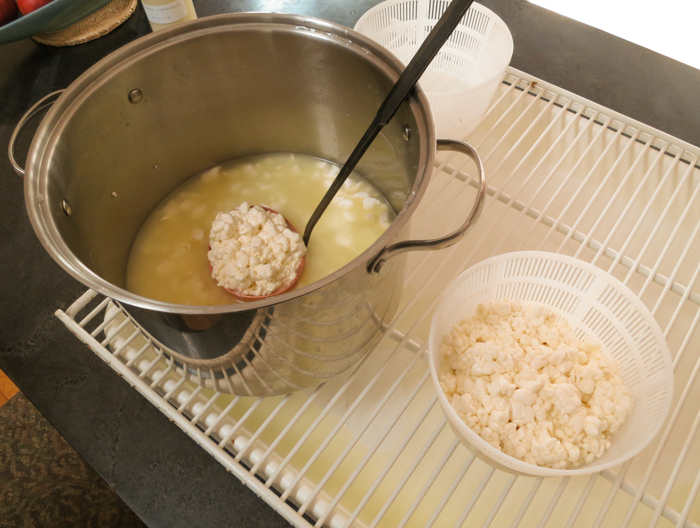 Now, it is time to begin drying out the curds. This will be done by returning the heat to 96F (35C). The total cooking time will be 20-30 minutes. The longer it is cooked, the drier the final cheese will be. 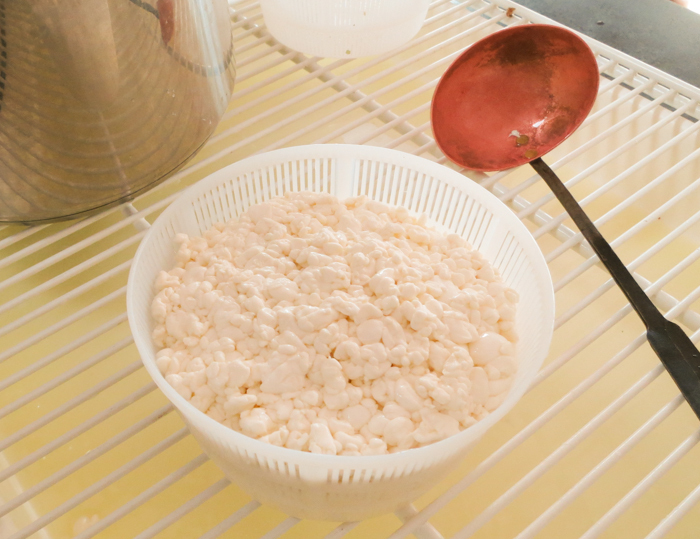 The whey should now be removed with a ladle to about an inch above the surface of the curds. Leaving a bit of whey for the transfer will help the cheese consolidate. 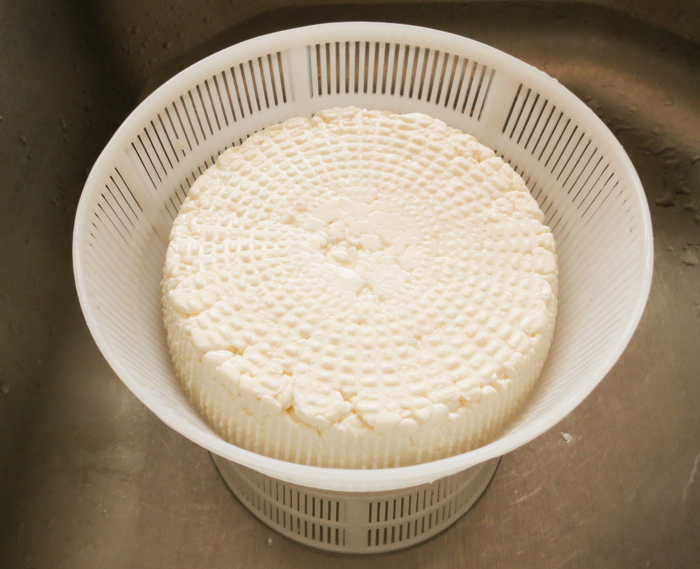 Now, simply transfer the curds to the basket mold and allow the whey to drain. A small amount of weight (1-2 lbs) can help consolidate the curd and produce a slightly drier curd, but this is optional. Here, I have used just a bit of hand pressure to consolidate the cheese. Plus, the weight of the cheese during the drainage seems to give me the texture I want. 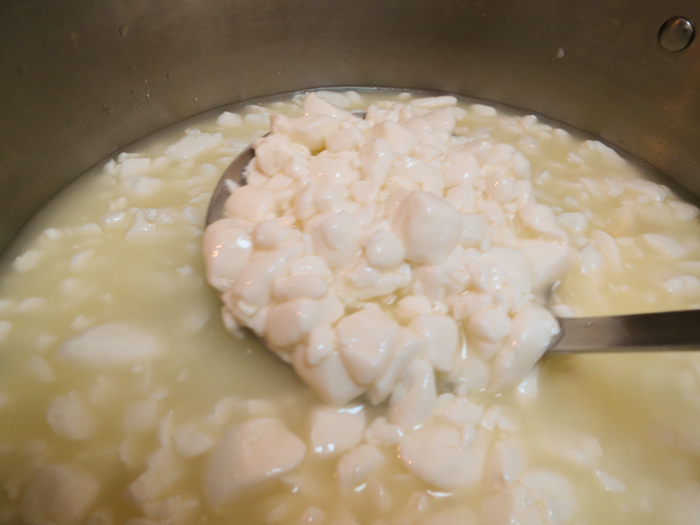 Turn the curds as they drain and firm up. Doing this several times during the draining will keep the moisture even. 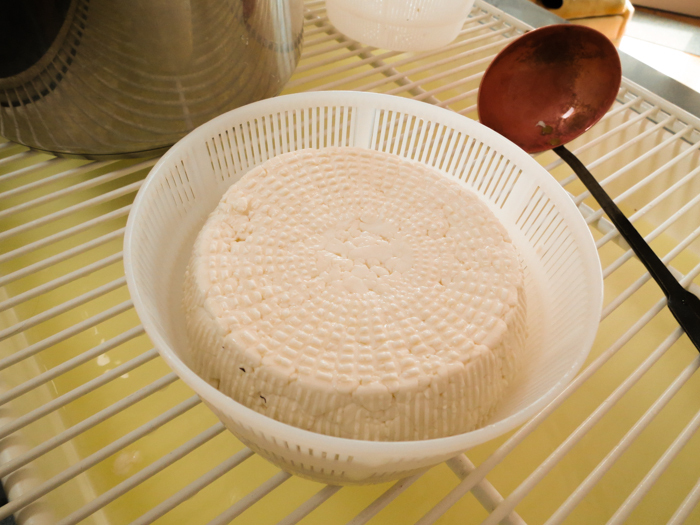 The cheese is now ready to use and due to its high lactose (milk sugar not fermented) it will go "off" in just a few days. 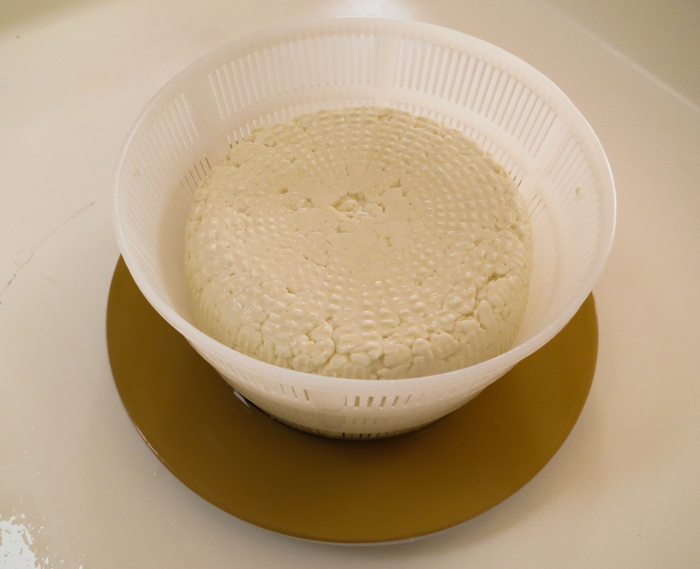 The draining cheese should be placed in the refrigerator as soon as the whey drainage slows, but with a bowl underneath to collect the small amount of whey that continues to drain. 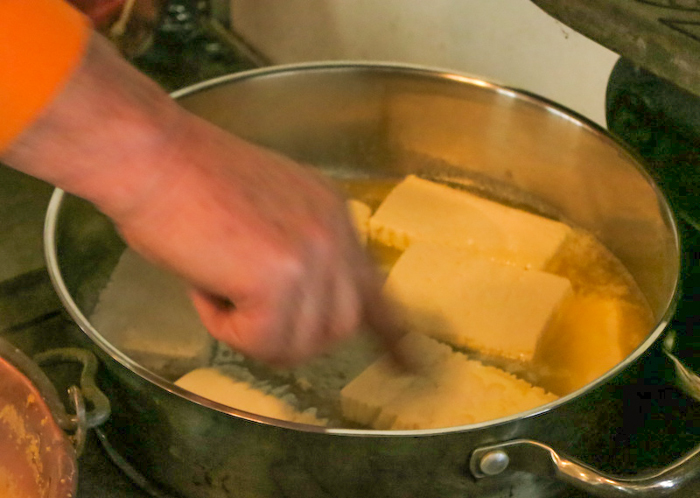 To cook, start with half a block of cheese made from 2.5 gallons of milk the night before. Slice it up to size for the pan. Then add a bit of butter into the pan to melt along with a pinch or two of salt. Add sliced cheese into the pan. Liquid whey will drain from the cheese while cooking. The cheese softens but does not melt. It will have a beautiful caramelization. Pour in a little cream, just in case there isn't enough butterfat. This is a great combination with the cream sauce to go with polenta or even over some wide cut pasta like Pappardelle. 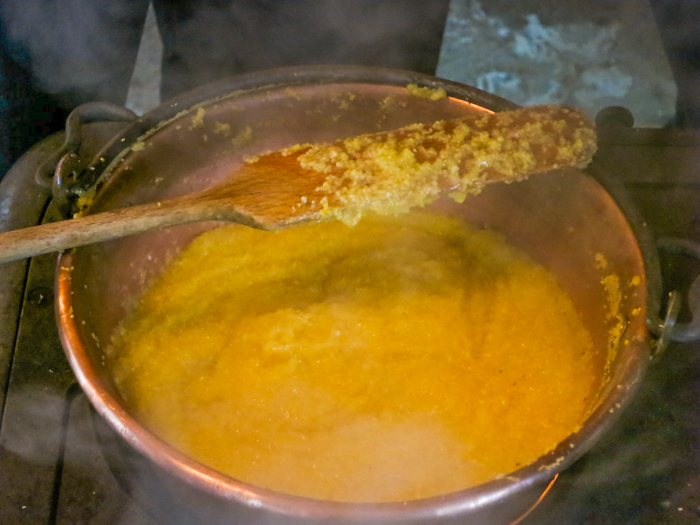 Polenta is a coarsely ground corn, typically used in this northern region of Italy as the major carbohydrate and can be anything from a base of simply ground corn and water to richer dishes with the addition of cheese, peppers, truffle oil, etc. It can be served directly from the pan or cooled and grilled for a greater depth of flavor. A bit further south along the Po River Valley, the dominant starch is rice and further south it becomes wheat-based as in pasta. 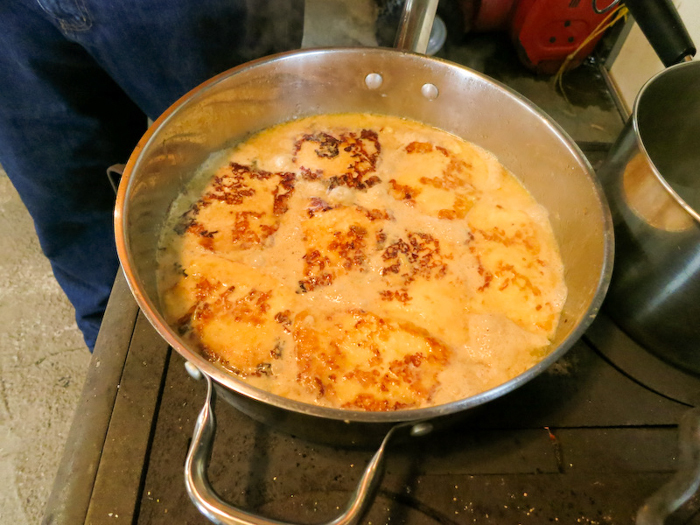 This fried cheese can be served with any of these but here in the north it will be served with polenta. 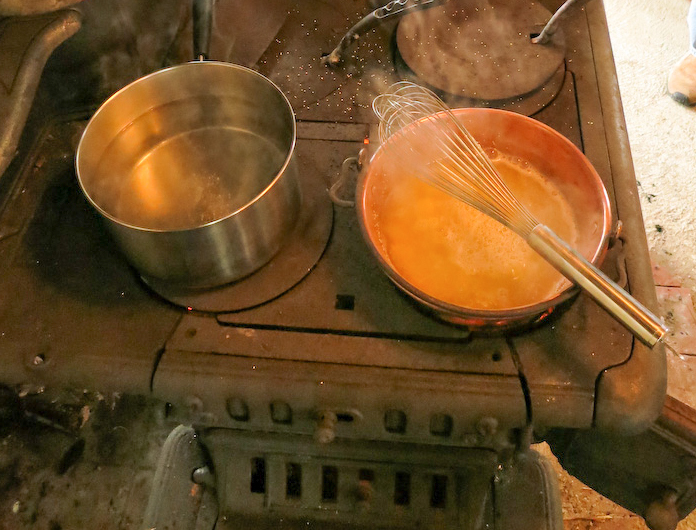 With the wood fire throwing out a good amount of heat, one of the lids is taken off the wood stove and the heavy copper polenta pan is placed right over the open fire. Don't worry, Italians say that all good polenta needs to form a good crust, but just don't burn it. 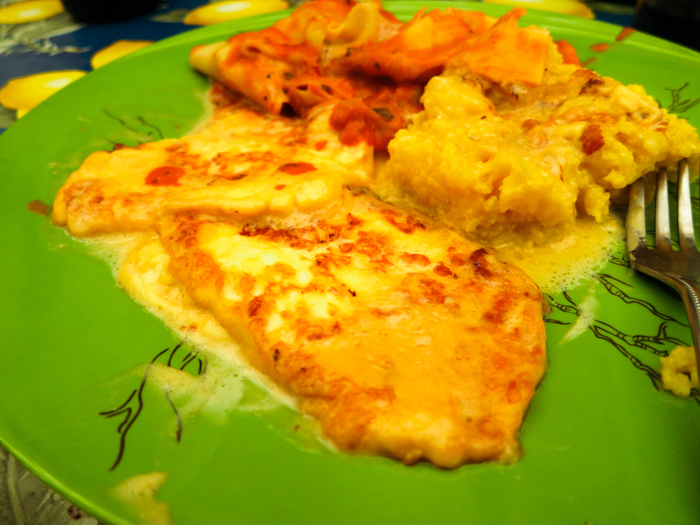 Once the polenta is finished, it can now be either served up or poured into a pan to cool, where it can be cut and reheated or grilled before serving. 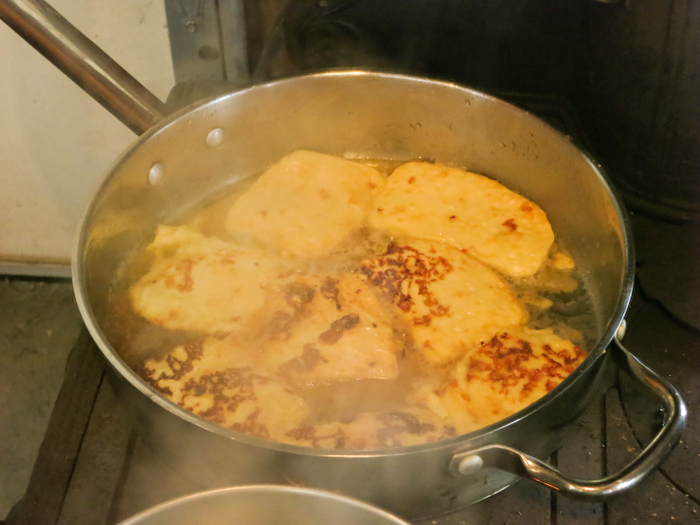 Our fried Schiz in cream with Polenta is now ready and it is time for lunch. I think I have finally found a cheese that few of our cheese makers have ever heard of. As many of you may already know, I love all things Italian, even though my background is Welsh and Irish, go figure. I do belong to a "Circollo Italiano" group in the valley where we live and one of my friends from this group has been after me for years to make this particular cheese for him since it is from his family home in Northern Italy. After some time researching this, I soon found out that it's not just a cheese but a meal as well as a lifestyle. This month's cheese comes from the eastern area of the Dolomite mountains, centered around the town of Belluno in Northern Italy. This has been an area with a rough history of invasions, wars, and folks needing to make do with very little - so, this cheese was born of their resourcefulness. Today, in spite of improved economic times, there is still a grand effort in this region to preserve the tradition of simple good food such as this. Schiz was traditionally a part of a cheese destined for market that was set aside to feed the dairy folks on the mountain. When the curd was closed in the molds and pressed, the surplus curd would squeeze out, so it was cut away and carefully collected. 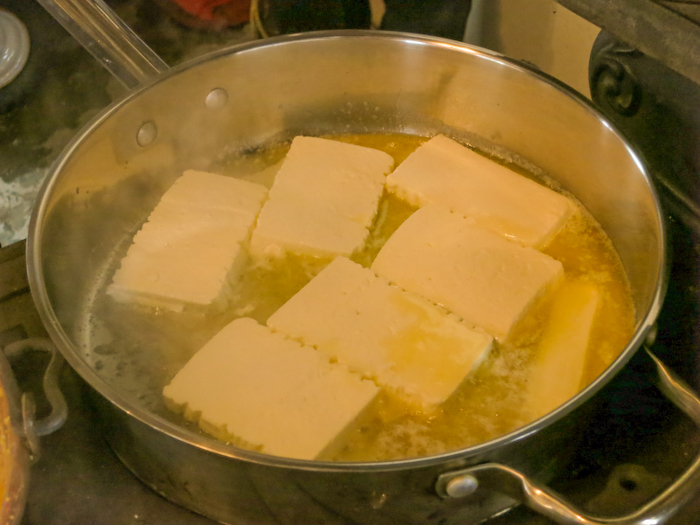 This surplus curd, referred to as ‘Schiz,’ was cut into strips and fried in a pan. It was a humble but very nutritious meal for these people from the Alpine pastures. The cheese would not keep well and sensibility called for it to be eaten quickly, so into the frying pan for lunch it went. Fried with a bit of butter and cream this cheese holds up to the fire quite well and to this day is one of the favorite traditional cheeses of this area. It is normally accompanied by their local Polenta. Schiz is made from whole or semi-skimmed cow's milk cheese and is produced in the province of Belluno. It has a very traditional history and is usually prepared by cooking in a pan with butter, salt, and some added cream. The name was probably suggested by its sizzling sound (in Italian that's schizza) during cooking as it's moisture is released. The cheese is rindless, soft, semi-cooked, and is lightly pressed into square molds. This cheese is salted only at the time of consumption. It has a compact body, elastic texture and retains the flavor of sweet milk. Now, you will notice no mention of bacteria culture in this guide, which makes this cheese very unique. From a process point of view, this means that none of the lactose in the milk is converted to lactic acid, so the final cheese will retain it's sweetness. Since no lactic acid production takes place to cause moisture to flow from the curds, the cheese will retain a much higher moisture. The lack of acid will also give a much more elastic texture to the cheese. This cheese will hold up to the fire, it will soften but not melt and the residual milk sugars will caramelize and produce that wonderful rich flavor. 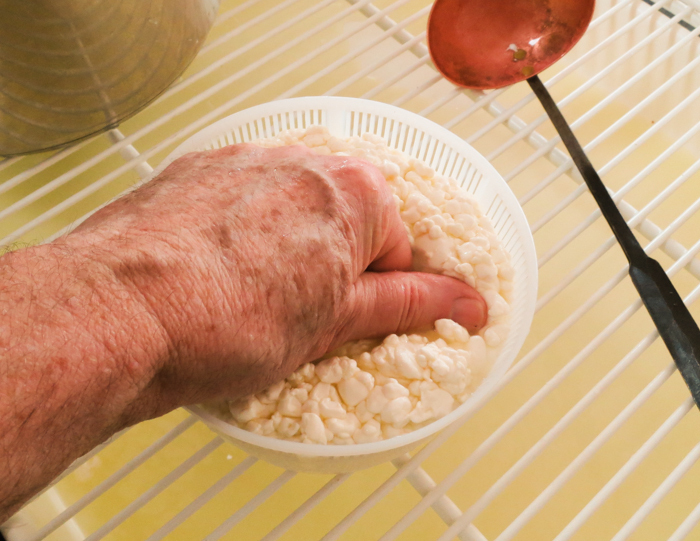 The cheese must be consumed fresh because even at refrigeration temps the milk sugars will be good subjects for any ambient bacteria to feed on, causing the cheese to become sour in a matter of 6-10 days resulting in off flavors and smell. My friend from Belluno says that in his home town they would need to place an order with the dairy to pick up the cheese the next morning to get the freshest cheese possible for their meal. Another interesting point is that no salt is added to the cheese during the cheese making. Since this normally is added to slow/stop the bacteria and causes more whey to be expelled, this will add to the final high moisture in the cheese and the need to use it quickly. Easy to follow instructions and fun to make. However when I went to take a little taste test - I thought “this really needs salt.” Well, the recipe didn’t ask for any salt so this makes sense. I am not a big salt person, but the cheese tasted like coagulated milk. So I added a small amount and then put it into my cheese mold. It was a lot better after the salt. It was wonderful when I fried it in butter. Tasted like the inside of cheese blintzes! I served it with Amish double egg noodles and some homemade tomato cream sauce. My husband and I loved it. Overall, this was a fun cheese to make. Very clear instructions. But, when I tasted the curds just before draining - it was "too milky in flavor." I was concerned that the end product would also "need salt." So I added a light amount of salt and this was a vast improvement to me. Note - upon more research, it is a hallmark of this cheese to be salt free. Ok, well, that's not for me. I used the insert of a salad spinner for my cheese basket. This worked well for an improvisation but probably a little too wide of a diameter. Anyhow, tomorrow I will cut into strips and fry it up with butter and salt. But I couldn't resist taking a small cut square. VERY TASTY.